Scientific and popular literature on modern cosmology is very extensive; however, scholarly works on the historical development of cosmology are few and scattered. 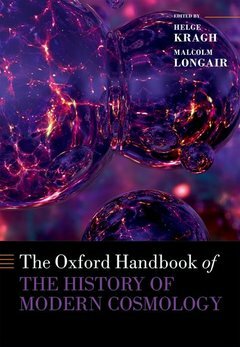 The Oxford Handbook of the History of Modern Cosmology offers a comprehensive and authoritative account of the history of cosmology from the late nineteenth century to the early twenty-first century. It provides historical background to what we know about the universe today, including not only the successes but also the many false starts. Big Bang theory features prominently, but so does the defunct steady state theory. The book starts with a chapter on the pre-Einstein period (1860-1910) and ends with chapters on modern developments such as inflation, dark energy and multiverse hypotheses. The chapters are organized chronologically, with some focusing on theory and others more on observations and technological advances. A few of the chapters discuss more general ideas, relating to larger contexts such as politics, economy, philosophy and world views. Helge Kragh gained doctoral degrees in physics (1981) and in philosophy (2007). He was a high school teacher in physics and chemistry (1970-87), and then later a professor of history of science at Cornell University, USA; University of Oslo, Norway; and University of Aarhus, Denmark (1987-2015). After retiring, he is now emeritus professor at the Niels Bohr Institute, University of Copenhagen, Denmark. Malcolm Longair is Director of Development and Outreach, Jacksonian Professor Emeritus of Natural Philosophy at the Cavendish Laboratory, University of Cambridge, UK. He also holds the position of Editor-in-Chief of the Biographical Memoirs of Fellows of the Royal Society (2016-2020). Longair has previously held positions as a university lecturer in the Department of Physics, University of Cambridge (1970—80); Astronomer Royal for Scotland, Regius Professor of Astronomy, University of Edinburgh, Director of the Royal Observatory, Edinburgh (1980-90); Jacksonian Professor of Natural Philosophy, University of Cambridge (1991—2008); andHead of Cavendish Laboratory (1997—2005).